Welcome back to the Classroom Slice of Life Challenge! You made it to Day 15! A mentor once told me, “Writing yourself, alongside your students, helps you to see where things are hard, and where things are possible.” We hope you are seeing both of these sights along your writing journey as you work alongside your students across this challenge. Many of us find so much value in finding our way through the hard parts because we can turn around and teach those strategies to our students. 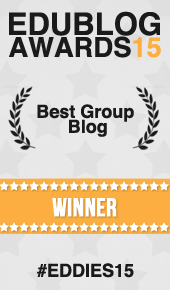 It’s still not too late to grab this badge for your personal blog. Celebrate that you are writing along with your students! Please only post the link to your students’ slices of life here. Do not post the link to your personal slice of life stories here. Since we are mid-challenge now, please click here if you would like a full listing of reminders that have been included at the bottom of each Classroom Slice of Life Challenge page. It will take you back to March 14th where, at the bottom, you will find all repeating reminders. I have given up on my own blogging for this year. My students are posting like crazy and commenting so it is time consuming but great! We are very late to the party today, but my one so faithful slicer has a myth for you and my future president has another installation in his “Why I Want to be President” series. Enjoy! Snowy Slices! There’s even a poem included today…the weather was certainly inspiring these 5th graders! Monday Slices, Wednesday Post–it’s been a crazy week for my kindergartners and me! I’m so late to the party today! Here’s my middle school kiddos, their posts are in my comments section! It seems like the weather is a popular topic of conversation here, there and everywhere! It looks like this link is your adult challenge post. Be sure to post this on the adult challenge comments section. 7th grade blogs on the right side of the page. Halfway there and still going strong. Scroll down the left side of the page to find our students’ posts. 3rd graders blogging in NY! Teacher misses posts, but kids keep blogging! Slicers, learning and growing as a part of this writing community. Oh no! I forgot to post yesterday’s slices before the comments closed…adding them here. Enjoy! First graders in Virginia. Only three finishers today, but lots of drafts to be completed and shared tomorrow! First Graders from VA – Slice, slice, slice! Any other KidBlog users out there? We’d love to visit yours and you visit ours! Happy slicing. 7th graders are back! We went to a play at our local high school today…some will be reviewing this production. Halfway through our challenge! My third graders are still so excited to be blogging! 3rd Graders at the halfway mark! We have conferences today but students are posting from home! My fifth grader are blogging from Singapore.